X-Small - $154.99 Only 2 left! Large - $154.99 Only 1 left! Who does Batman think he is anyway? He’s always gallivanting around Gotham City, solving crimes with his so-called “genius” level detective skills. He’s always acting like he’s the smartest guy since Alexander the Great. He’s not. He doesn’t even hold a candle to your genius! He probably couldn’t even solve one of your famous riddles, which are quite well known to boggle the mind. Maybe it’s about time that someone finally put him in his place. Perhaps it’s time for you to take the job! Riddle me this! What laughs like a maniac, creates the best riddles and gives Batman trouble at every corner? Well… you, of course! This men’s Riddler costume gives you the opportunity to live out your dream of being a thorn in Batman’s side! It comes with the classic green jacket that has question marks printed all over it. 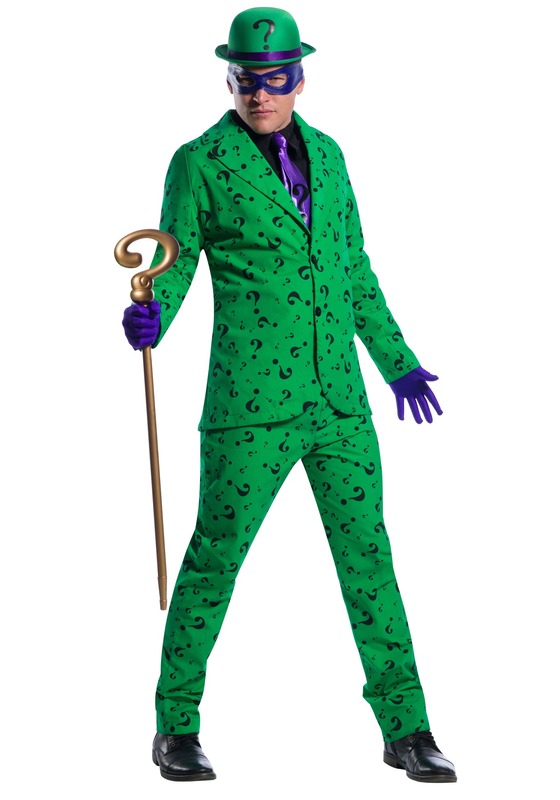 The matching pants fit with an elastic band around the waist to continue the iconic look and a matching green derby hat with a question mark finishes out the look. The costume also comes with a shirt and tie combination to give you a slightly refined supervillain style, and the gloves really put the look to the next level. Combine this whole costume with your razor sharp wit and you’re sure to give Batman plenty of trouble this year! Just make sure you start your plotting now! You’ll need plenty of riddles and master schemes if you plan on keeping pace with Batman (and you definitely want to put Batman in his place).